The following two essays originally appeared in Engines of the Night: Science Fiction in the Eighties by Barry N. Malzberg (Doubleday, 1982). Kindle Edition and is reprinted here by permission of the author. n in wondrous machines from a burning city and thus made it impossible for serious critics, to say nothing of serious writers, to have anything to do with it. After all, in the early part of the century novels of the speculative and fantastic were part of the literature; the Munsey magazines ran futuristic adventure serials all the time, and Hawthorne and Melville were writing fantasies or absurdist speculation without any damage to their literary credibility. It simply could have gone on that way, the revisionists suggest; science fiction would not have been thrown into a charnel house which it would spend four decades trying to escape, seeking that respectability and acceptance it had possessed before Gernsback defined it and made it live by its worst examples and most debased audience. Photo by Ellen Datlow. Used with permission. The argument has a certain winsome charm — I believed it myself when I was but a wee lad, and some of our best or better minds hold to it right now — but is flawed. At the risk of aligning myself with Hugo Gernsback, a venal and small-minded magazine publisher whose reprehensible practices, long since detailed, were contemptible to his contributors, partners, and employees, I think that he did us a great service and that were it not for Gernsback, science fiction as we understand it would not exist. We would have — as we do — the works of fabulation in the general literature — Coover, Barthelme, Barth, and DeLillo — but of the category which gave us More Than Human, The Demolished Man, Foundation and Empire, Dying Inside, The Dispossessed, and Rogue Moon we would have nothing, and hence these works would not exist. It is possible that some of these writers, who were inspired to write science fiction by a childhood of reading, would never have published at all. “Science fiction builds on science fiction,” Asimov said once, and that truth is at the center of the form. Before Gernsback gave it a name (he called it “scientifiction,” but close enough; Ackerman a few years later cast out a syllable), the literature did not exist; before he gave it a medium of exclusivity, its dim antecedents were scattered through the range of popular and restricted writing without order, overlap, or sequence. It was the creation of a label and a medium which gave the genre its exclusivity and a place in which it could begin that dialogue, and it was the evolution of magazine science fiction — slowly over the first decade, more rapidly after the ascension of Campbell — that became synonymous with the evolution of the field. Only the rigor and discipline of the delimited can create art. Musicologists considering Bach, who worked within desperately restrictive format, will concur as will those considering the sonata form. The sonnet and the eight-bar chorus of almost all popular song and operetta give similar testimony. It was the very restraint with which science fiction was cloaked from the outset which gave the genre its discipline and force. Without the specialized format of the magazines, where science fiction writers and readers could dwell, exchange, observe one another’s practices and build upon one another’s insight, the genre could not have developed. influence . . . upon influence. Science fiction, as John W. Campbell once pointed out expansively, may indeed outdo all of the so-called mainstream because it gathers in all of time and space . . . but science fiction as it has evolved is an extraordinarily rigorous and delimiting medium. Like the canon and the fugue, the sonnet and the sonata, like haiku, it has its rules, and the control of those rules is absolute. Extrapolative elements, cultural interface, characteriological attempt to resolve the conflicts between the two: this is science fiction. The fact pervades all the decades after about 1935: no one could publish science fiction unless exposed to a great deal of it; virtually everyone who has ever sold a story has a sophisticated reader’s background in the form, usually acquired just before or around adolescence. At the underside, this has led to parochialism, incestuousness, and the preciosity of decadence (and there has been too much). In the end it may even be these qualities which finish science fiction off, make its most sophisticated and advanced examples increasingly inaccessible to the larger reading audience. But whatever happens to science fiction, it would not exist at all if it had not been given a name and a medium and for this, if we are not led to praise Gernsback, we must entomb him with honor. He was a crook, old Hugo, but he made all of us crooks possible. I edited Amazing Stories and Fantastic Stories, bimonthly science fiction magazines, from April 1968 to October 1968; it was not the best of times but was hardly the worst either (although in my youthful exuberance I then thought it was). I was the magazines’ only employee, edited them from my bedroom, delivered the copy-edited, blurbed manuscripts to the printer, proofed the galleys. Art and layout were handled by the publisher from his home, the publisher assuming more expertise in these areas (he had to be right) than I. Eventually, a dispute over control of the art — I commissioned a couple of covers but the publisher did not want to use them and I threatened to quit if he didn’t — caused me to be fired by telephone on a Sunday afternoon just as the Giants were about to score a touchdown (prophetically they did not), but that is not the subject of this essay nor is my salary ($100 a month to start, merit increases up to $150 right before the end), nor is my self-image at the time as the logical successor to Hugo Gernsback, T. O’Conor Sloane, Raymond Palmer and Paul Fairman. I was quite young. Amazing, after Ziff-Davis publishers precipitately dumped it and its miserable sister in 1965 because of declining sales (although their last editor, Cele L. Goldsmith, was certainly the best magazine editor extant then), had fallen upon desperate times; the publisher had acquired it, if not for a song, at least for a medley, and it was his hope to float it along by access to the magazine’s backlist (Ziff-Davis had purchased all serial rights, granting unlimited reprint). Joseph Ross was his first editor, Harry Harrison unhappily the second and I ambivalently the third: only when Ted White began his ten-year stewardship and commenced to make real inroads on the publisher’s obduracy did the publication or its companion have any impact again. No, my editorship was of little moment and although I was able to find and publish some expert work (Lafferty’s This Grand Carcass,Yet, Wodhams’ Try Again, Richard C. Meredith’s first novel, We All Died at Breakaway Station), I never thought of myself as much more than an adequate editor. I was able to separate good from bad and publish the better; this seemed the minimum requirement but I have subsequently learned that in contemporary publishing it is the last. My tenure was obviously too short to matter and the circulation of the magazines — possibly 24,000 — would guarantee that whatever I did would be at the margins of a marginal field. Nonetheless, the magazines which at that time were publishing only 12,000 words of original material an issue — three stories of average length or a long novelette and a short one — received through the six months of my tenure an average of one hundred manuscripts a week. The scripts came from unknown and unpublished writers in preponderance, of course, but at least 25 percent of them, week after week, were signed by recognized names: some of them, like Leiber or Lafferty, at the top of the market as then constituted; others, like Wodhams, Koontz, Meredith, or David R. Bunch, well in the middle range. Most of the manuscripts were, to be sure, not publishable, but 15 percent of them (and more than half of those turned in by the professionals) were, and at least a third of that 15 percent, or five manuscripts a week, were outstanding. It is no exaggeration to recall that I received throughout my editorship sixty stories a month which by any standard I could ascertain were as good as or better than anything published in the competing magazines. I was only able, because of space limitations, to buy perhaps twenty of those stories and perhaps another fifteen which were of lesser standard, which means that I rejected consciously about forty stories which were better than some I bought.2 The word rate in all cases but that of Leiber and Disch was a penny a word on publication or shortly thereafter and all of the writers, every one of them, were glad to accept the terms. The stories were published, one of them (the Lafferty) was in a best-of-the-year collection and a couple more wound up in author collections. driven toward science fiction because the quality lit market no longer exists. And there are the usual host of science fiction fans/readers led naturally through their experience to attempt to write. What is being lost now? How many stories in oblivion, how many careers unable to begin? Forget the field for the moment. We owe the field little at this point. What is the cost to these people of all of that failure and bitterness? 1. Neither writers nor stories are machinery, of course, and it can be presumed that Amazing preempted in certain cases some of the markets on the list, but certainly I was seeing nothing on first submission. 2. You know the perversity of editors — or at least I do. The others, for the record, were Robert Heinlein, Isaac Asimov, A. E. van Vogt, and L. Sprague de Camp. Barry N. Malzberg is an award-winning author with the distinction of having edited Amazing Stories (and Fantastic) for less than a year. He filled the position after Harry Harrison left and before Ted White assumed the helm. Prior to that, Barry’s novel – Beyond Apollo – shook the field up with its negative portrayal of the space program and America’s future in space. Space travel, colonization of the solar system and beyond were fixtures of the SF field one might almost say its reason for being. Beyond Apollo contended that our race for the manned Moon landing was nothing but political grandstanding and – despite Barry’s own stated belief that SF is non-predictive in nature – Beyond Apollo correctly portrayed the United States’ abandonment of manned space flight (and largely for the very same reasons Malzberg had proposed in his novel). 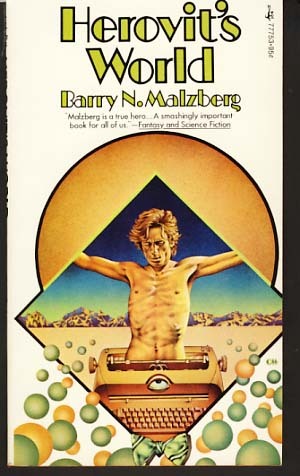 Many readers may not realize how prolific Mr. Malzberg has been due to his use of pseudonyms; while working as an agent for the Scott Meredith Literary Agency, Barry thought it best to sell his own work under the K. M. O’Donnel byline (the name derived from the names of Henry Kutter, C.L. Moore and one of their collaborative pseudonyms – Lawrence O’Donnel). 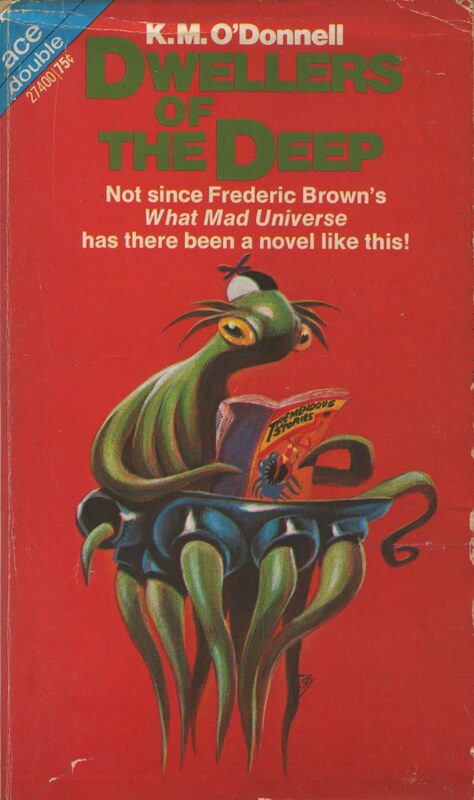 My first acquaintance with Malzberg’s works were two SF comedy novels written under the K.M. O’Donnell byline – Gather in the Hall of the Planets and Dwellers of the Deep – send ups of the science fiction field, its fans, editors, authors and publications. I would later discover his other works, including Herovoit’s World, Beyond Apollo, SCOP, all of which I highly recommend. Barry has an economy of style second to none and a very biting and emphatic viewpoint. Additional details of his background are well covered in Wikipedia and the Science Fiction Encyclopedia. Of late he has been working on various projects including the Galaxy reprint series and serving as a judge for the Cordwainer Smith Rediscovery Award (given out each year at the Readercon convention “for authors who display unusual originality, embodies the spirit of Cordwainer Smith’s fiction, and deserves renewed attention or ‘Rediscovery'”). Editors Special Note: Mr. Barry N. Malzberg was the first professional in the field to contact me following my announcement of the acquisition of Amazing’s trademarks and has given enthusiastically and generously of his time, insight and experience, for which I am eternally grateful. The two pieces presented below were originally published in Mr. Malzberg’s collection of essays Engines of the Night: Science Fiction in the Eighties, which won a Locus award, was later incorporated into the collection Breakfast in the Ruins, itself a Locus award winner and Hugo Award finalist. Additional information on Mr. Malzberg, including interviews, excerpts of interviews and bibliographies can be found here (Locus Interview), here (Baen – profile) and here (SF Encyclopedia entry) and here (SFSignal interview); one of his latest projects can be found here (Galaxy Project). 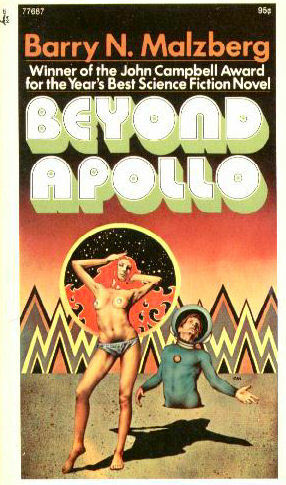 And according to this website, Beyond Apollo is heading for the big screen. You can also listen to Barry describing fifteen of his favorite issues of Astounding Science Fiction magazine – one of Amazing’s rivals – in this Youtube video. 2 thoughts on "Thoughts On Amazing Stories, Part 1: Barry N. Malzberg"
“Thank You!” for posting these essays by Mr. Malzberg. Just read and enjoyed his latest essay collection, THE BEND AT THE END OF THE ROAD, which I submitted as a “Suggestion for Purchase” at the Pasadena Public Library in California. There’s more info about this 2018 book at http://www.amazon.com in case Other Interested Readers would like to buy it or ask for it at their local libraries. Highly Recommended by this Long-Time SF Reader.